depot locations. 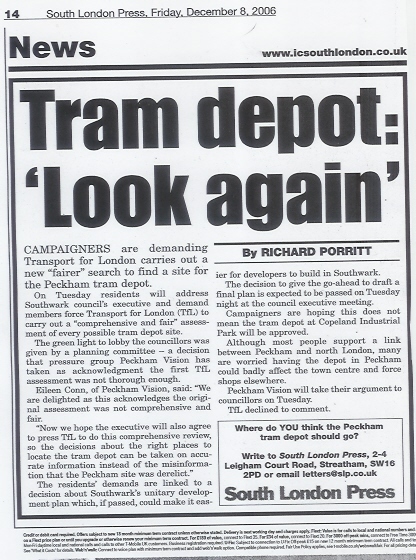 In Peckham Vision our campaign has been rightly pressing for a review of all possible tram depot locations. In order to correct the flawed way in which the proposed depot site right in the heart of Peckham town centre was chosen, the review must include an accurate and transparent comparison in public, of the merits and ‘dismerits’ of each site. 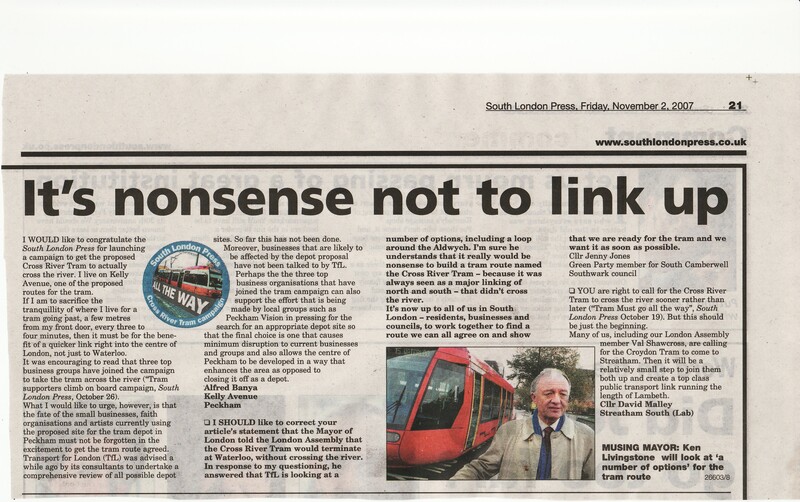 So, I urge Val Shawcross and all those who want to see good decision making on the tram, to press for transparent feasibility study, including Environmental Impact Assessment, not only of Burgess Park but all other possible tram depot locations along and around the whole of the proposed tram route. A lot has happened since the last blog. Here are some of the latest developments. More to follow. If you are interested in the cross river tram – have you had your consultation brochure yet? If not get a copy from TfL at Freephone 08002 346 004 email crt@tfl.gov.uk www.tfl.gov.uk/crt The deadline for comments is 3O January. The main consultation about the depot will happen later. But this brochure shows two options for the terminus – 1. going down Clayton Rd, Consort Rd and through the proposed tram depot site; 2. going down Cerise Road ending at the Multi storey car park. Both equidistant from Peckham Rye train station, but the Cerise Rd one is shorter and has less effect on houses and traffic, and could happen without a depot in Peckham. 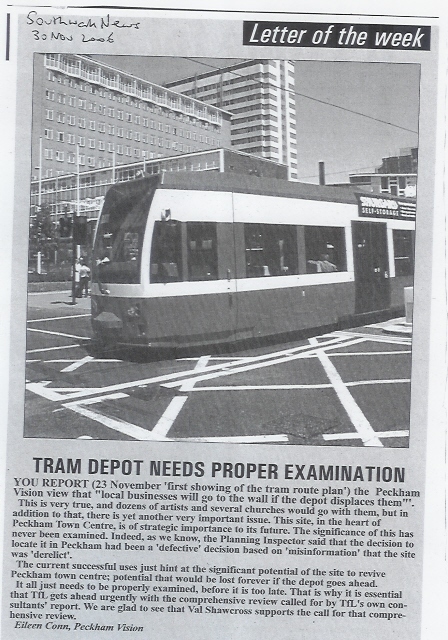 Peckham Vision is suggesting people mention their concerns about the depot plans in the space for comments in the tram route consultation reply form, and support the call for a comprehensive review of all possible sites BEFORE the tram depot consultation. TfL are looking at a number of other sites, but this needs to be transparent and accurate unlike their previous site selection processes. The review needs to asses the technical issues, the costs, and the accurate positive & negative impact on each & every possible location, and the results made known before or at the beginning of the tram depot consultation. Meeting with TfL on Thursday 1 February 7pm – 9pm at Willowbrook Centre, 48 Willowbrook Road, SE15 (Peckham Hill St opposite Bird in Bush Road). Organised by the Friends of Burgess Park. Get your queries answered by TfL, and discuss with others the issues of various options. Proposed by Peckham Vision, this has now been set up, and is open to anyone interested in making a contribution. There will be a series of meetings over the next few months at the town hall to discuss the details across a number of topics covering the route options, the depot, and the benefits and disbenefits of the tram and the depot on Peckham. If you want to be involved in this, you need to be on the Council mailing list – email: liza.morshead@southwark.gov.uk phone: 020 7525 1018. A Peckham Vision deputation to the Planning Committee Tuesday 5 December asked them to support the call for a comprehensive review of the tram depot locations. As a result the Committee have agreed to ask the Executive to make every effort to urge TfL to do a ‘comprehensive and fair’ assessment of all the possible depot locations. 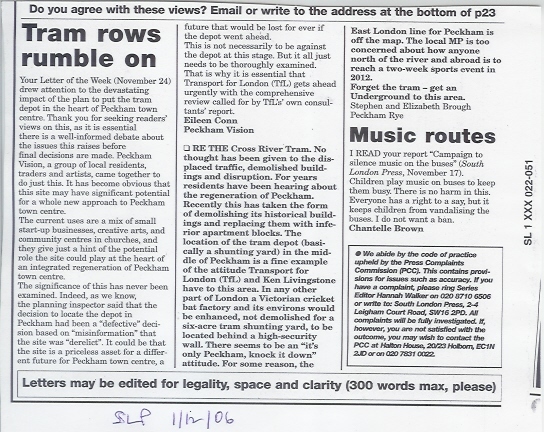 Peckham Vision have requested a deputation to the Executive at their meeting on 12 December to ask them to support the PLanning Committee’s call.